There are many people in Longmeadow who believe that the current high school building project as developed by the School Building Committee and approved by the MSBA is too costly. If the June 8 ballot question on the Proposition 2½ debt exclusion override is defeated, would the MSBA be receptive to an alternative proposal that significantly reduces the overall cost to the town by modifying/eliminating the "renovation" portion of the project scope but retains the MSBA reimbursed portion? Ms. Craven provided the answer that I was expecting to hear since she would not want to sabotage the upcoming Special Town Meeting and Town Election result. Ms. Craven indicated that any changes in the scope and/or cost of the current "as MSBA approved" project + scope would need to be revisited by the SBC, project architects and MSBA before a new path forward could be determined and that might take some time. With the current backlog of projects that might not be accomplished before the end of 2010. However, the door was left open for an alternative project scope in the event of a failed vote at town meeting or on election day. Ms. Craven stated at least 4-5 times during her comments that "there is no line" and that the MSBA recognizes Longmeadow's urgent need for a new/renovated high school and would be willing to discuss potential options with Longmeadow. Below are some short video excerpts of Ms. Craven's comments and answers to specific questions (provided by LCTV). Respect for the opinions of others…. I created the LongmeadowBuzz blog some 2½ years ago as an alternative to many of the current venues for discussion of local topics and issues such as “Letters to the Editor” in the Republican/ Reminder/ Longmeadow News and the MassLive- Longmeadow forum. As someone who occasionally visits and posts on the MassLive forum I can tell you much of the dialog that takes place there does not reflect very well on the town of Longmeadow or its residents. LongmeadowBuzz is a moderated forum with contributing participants being “respected” members of our community including both town residents as well as school, business and government officials. The LongmeadowBuzz blog allows only approved contributors to initiate new subjects (without moderation) and each contributor is asked to post under their real name. Most participants understand what is acceptable content for posting on this type of forum and that abuses will not be tolerated. The high school building project has created a large amount of heated discussion- much of which has appeared here on the LongmeadowBuzz blog. Most recently, a number of postings by Jerold Duquette have crossed the line with regard to respect for the opinions of others. 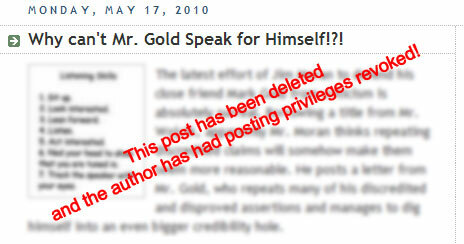 Mr. Duquette has been warned a number of times about the content of his postings- most recently about two weeks ago. For this reason I have deleted Mr. Duquette’s latest posting and have removed his author privileges so that he will no longer be able to post in the future. In response I’m sure that Mr. Duquette will “discuss” my actions on the MassLive forum….. just look for the JeroldDuquette handle if you are interested in reading his commentary. I believe that his abusive verbal bullying has actually discouraged people from expressing their opinion on LongmeadowBuzz. I'm hoping that my actions will encourage others to step up and express their opinions- both for and against the school building project. If you are interested in participating on LongmeadowBuzz, please send an email to longmeadowbuzz@comcast.net. In your last posting on the LongmeadowBuzz, you continued to portray Mr. Gold as an uninformed and misguided town official in an attempt to silence his opposition to the School Building project. Contrary to all of the rhetoric, Mark is well versed about town finances and the school building project. His outstanding leadership and commitment during his one year term on the Select Board resulted in a BALANCED budget that was overwhelming approved at last week’s annual town meeting. It’s interesting to note that two current Select Board members (Mr. Aseltine and chairman, Mr. Barkett) voted AGAINST the approved budget because they wanted to see more cuts in the town side of the budget. Both are strongly in favor of the High School Building project. I would urge you (as well as Ms. Swanson and other School Building proponents) to spend more time listening and less time bashing Mr. Gold’s position. Below is a response by Mark Gold to Ms. Swanson’s recent criticism of his position. Much has been written over the past several weeks about Longmeadow High School and it is appropriate for me, as a candidate for reelection to the Select Board, to offer my position. In the six years I served as chair of the Capital Planning Committee and in this past year as a member of the Select Board, I have come to understand and appreciate the serious deficiencies in our high school physical plant. I believe strongly that improvements – major improvements – need to be done to this facility. My work as a Select Board member in leading the development of this year’s operating budget compromise has also shown me the limits of our financial resources and how much Longmeadow will change if we are unable to maintain the diversity and quality of services that so distinctly characterize this town. I have carefully and thoughtfully reviewed the high school project proposal that is currently before the residents of the town. It is precisely because I care about the schools, education, and the issues that attract and keep residents in Longmeadow that I have concluded that this project, at this time, is not the right project for addressing the deficiencies of Longmeadow High School. At a cost to the taxpayers of $44.4 million, approval of this project will put a financial burden on the town that will unduly limit our ability to address other critical operating and capital needs we face in the coming years. It would have been a far more politically expedient position for me to support this project as it is proposed. However, it is because I have given this project so much thought and reviewed it in the context of my service as a member of the Select Board and within the broader needs of our town that I have concluded that this is not the right project at this time. The physical plant needs and other issues at the middle schools are of as equal concern to me as the needs of high school. As I look to those and the other overall needs of our educational system I realize that it is a mistake to focus on one issue without recognition of the other needs that are also within our field of vision. All the needs of the school system should be considered so that we understand the resource limits of the town and properly allocate them so that all the needs can be met over the coming years. There is pressure to support this project based on a sense of urgency; many feel that state aid will be withdrawn unless we move ahead now. Although project supporters may disagree, I look at the upcoming vote as A decision point, rather than THE decision point in this project. Other than “forum” presentations of options under consideration by the school building committee, this vote is the first chance that the residents of town will have to fully weigh in on the scope and cost of the project. The Center School project went through two voter rejections prior to its acceptance, and we ended up with a better school as a result of this process. I have read and understand the policy of the MSBA and have concluded that this is the wrong project at this time. The state will not turn its back on Longmeadow should we decide that our town needs further deliberation before moving ahead. Having stated my position on the project, and at the risk of reducing the discussion on the Select Board contest to a secondary referendum on the school project, it is important that Ms. Swanson’s erroneous comments on my response to a constituent’s questions be addressed. Although Ms. Swanson apparently received the entire contents of the e-mail I sent to a private individual in response to their questions, her responses to parsed quotations and selected segments appears to continue a policy of leaving no criticism unanswered and no critic unattacked. click here to read the rest of Mr. Gold’s letter. Don't be fooled! Say YES to Longmeadow's future! Just got a copy of the latest NO propaganda from Wojcik and Co. How can elected officials and candidates like Mark Gold, Paul Santaniello, Dave Gusfstason, and Bill Schebelli possibly want to be associated with such a nakedly wrong headed effort? I sincerely hope that these folks join virtually every other town leader, including Rep. Rogeness and her husband Dean, who are proudly displaying a YES sign on their lawn. This latest misinformation piece claims that we can utilize the MSBA appeals process in the event of a failed vote, which is true. What they fail to mention is that this would require starting over on a process that took us three years, and going to the end of a 400 project list with absolutely no guarantee of getting any money at all and a high probability of getting less money for a project that would cost more. Wojcik and Co have no understanding of the relevant processes. Their latest mailer even gets the payback schedule wrong. They claim we could renovate the HS for $40 million, instead of the proposed project of $44 million, which they see as excessive and unnecessary. Think about this. They are saying we should forgo getting $36 million of our own money back from Boston, and spend $40 million on a renovation that will NOT EVEN BRING THE HIGH SCHOOL UP TO CODE! That's right, they are relying on a report about the high school that didn't include most of the health and safety code violations. So they think taxpayers who can't afford the the extra $600 per year starting in 2014 and going down over the life of the loan CAN afford the extra $575 a year that their preferred option would cost(they hope). They also apparently believe that the money for the additional repairs as well as the money that we would save with the new HS will fall from the sky. They certainly haven't budgeted for it. They want us to waste $36 million of our tax money that we deserve to get back from the state, as well as the almost $1 million we've already spent and are currently paying for to develop this project (i.e. on the feasibility study required by MSBA). They want to spend another $1 million to re-apply with a project they prefer, which itself would cost us a couple million more to refine. All toll it appears that instead of spending $44 million and getting a brand new state of the art High School that will also have multiple community-wide uses and serve as a beacon of quality in our town, these folks want voters to opt for a renovation of the HS that at a minimum will cost the town $50 million. This $50 million is a low estimate when you consider the likely changes in the bond and construction markets. It also does not include the lost savings and increased costs of maintaining the "renovated" High school. They are claiming that financing $44 million over 25 years to buy a building that will save us nearly $150,000 in energy costs each year, to say nothing of the maintenance savings over the first decade of operation, will crowd out other needed expenses. Their solution is to SPEND MORE on a project already studied and rejected by both the state and town that will not increase the value of the town's largest capital asset, but will only keep it standing. I hope every resident gets this mailing. Not only has/will each point in it be thoroughly debunked between now and TM, it will be thoroughly debunked at TM. We sure do live in interesting times. Longmeadow has its own little "tea party" crowd willing to call up down, black white, and to try to scare old folks and library patrons into voting against themselves. Now they are going after every Longmeadow family having trouble making ends meet. These efforts to misinform are so weak on substance that these nay sayers have refused to debate the issue in public with anyone. They cancelled an appearance at Glenmeadow because they knew how badly their claims would look next to the slide show of the High School conditions being showed by the advocates of the project. They even tried to get Glenmeadow to let them come alone so they wouldn't have to be held accountable for their lies. Guess what date they asked for? You guessed it, May 24th. They wanted to scare these folks just in time to get them to vote against their own interests without an opportunity to get the facts. Longmeadow is almost certainly going to do the right thing on this issue, but that doesn't relieve us of the cancer represented by a certain small but hardy band of residents who harbor an inexplicable bitterness and deep seated need to fight against the interests of the community. It would be wonderful if these folks were actually serving as Devil's advocates who diligently hold our policy makers and our residents to account for preserving the quality of our town. Unfortunately, this role is not being fulfilled here, though it may be the line they tell themselves in the mirror each day. We need to come together in Longmeadow and move forward together. There is no future in dividing residents against each other. A resounding and overwhelming victory for Longmeadow on the 25th and on June 8th for the proposed project will indeed "save our town."